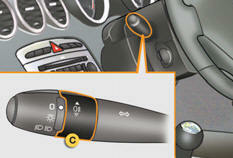 Control stalk for the selection and control of the various front and rear lamps providing the vehicle's lighting. - main beam headlamps to see clearly when the road is clear. turn it to position the symbol required facing the mark. 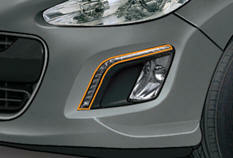 The foglamps operate with the dipped and main beam headlamps. When the lighting is switched off automatically (with AUTO model), the foglamp and the dipped beam headlamps will remain on. In good or rainy weather, both day and night, the front foglamps and the rear foglamp are prohibited. In these situations, the power of their beams may dazzle other drivers. They should only be used in fog or snow. To reactivate the lighting control, rotate ring A to the "0" position - lamps off, then to the desired position. 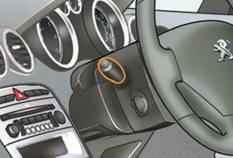 On opening the driver's door a temporary audible signal warns the driver that the lighting is on. The lamps, with the exception of the sidelamps, switch off automatically after a maximum duration of thirty minutes to prevent discharging of the battery. Where LED lamps are fitted, the fi lament bulbs for the daytime running lamps / sidelamps in the front lamp units are not used. * function that can be set in the vehicle configuration menu. The lighting control stalk must be placed in the "0" or "AUTO" (day mode) position. Deactivation of the daytime running lamps is effective after operation of the lighting control stalk or after the next engine start; activation is effective immediately. Turn ring to the "AUTO" position. 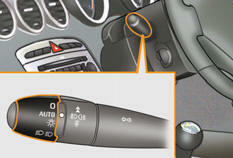 The automatic illumination of headlamps is accompanied by a message in the screen. Turn ring to a position other than "AUTO" . Deactivation is accompanied by a message in the screen. In the event of a fault with the sunshine sensor, the lighting come on, this warning lamp is displayed in the instrument panel and/or a message appears in the screen, accompanied by an audible signal. In fog or snow, the sunshine sensor may detect sufficient light. Therefore, the lighting will not come on automatically. When the automatic illumination of headlamps functions is activated, if the ambient light level is low the dipped beams remain on when switching off the ignition. Activation and deactivation, as well as the duration of the guide-me-home lighting can be set in the vehicle configuration menu. The activation, deactivation and duration of the welcome lighting are independant of the settings for the automatic guide-me-hope lighting.